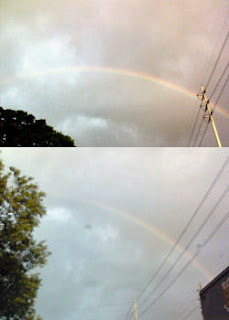 It's been a long time since I've seen a rainbow, moreso witnessing a full rainbow from end to end. Yesterday during a gloomy afternoon on my way home, I was able to take this picture from my celphone. Based on its span, I'd say one end is somewhere in Pasig and the other is in San Mateo, Rizal.